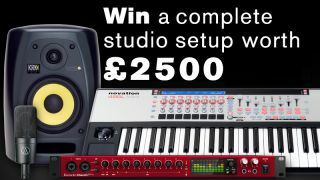 Win £2500 worth of Focusrite, Novation, KRK and Audio Technica gear! Fancy winning all of this? Of course you do. MusicRadar, in association with Focusrite and Novation, is offering you the chance to win an amazing bundle of hi-tech music making hardware. Just fill in the online survey and you could soon be getting your hands on a complete studio setup worth over £2500. This special prize includes one of the first Focusrite Clarett 8Pre Thunderbolt audio interfaces to roll off the production line (boasting 10-in/20-out operation and class-leading sub-1ms latency) and a pair of of KRK VXT 6 active monitors to plug into it. The bundle also features two industry-standard Audio Technica AT4033 condenser mics, while total control is taken care of by a top-of-the-line Novation 49SL MkII MIDI controller keyboard. To be in with a chance of winning this incredible trove of gear, all you have to do is complete the online survey. There's no prerequisite, you don't have to have any expertise, or have to own anything. Anybody over 18 is eligible to enter this competition worldwide. All you need is to be, or to have been, in the market for music production hardware - audio interfaces, keyboards, synthesizers, mic preamps, or MIDI controllers - at some point which, if you're reading this, is almost certainly you! The prize winner will be chosen at random, and you have until 26 April to complete the survey. Good luck! Click here to fill in the online survey.